On Sunday 21 Feb over 25 people participated in another HIV Boot Camp held in Varsha Memorial Hall at Deep Griha Society on Tadiwala Road. This Boot Camp was presented by a “team” of volunteers. The purpose of the “team” presentation was to give more volunteers ownership in the event and give them a chance to hone their public speaking skills. Emphasis was placed on motivating the participants to take the Wake Up Pune BE HIV POSITIVE message back to their schools and organizations by forming WUP satellites–creating an exponential expansion of HIV education, awareness, and support–hence the “team” work approach. The presenters, as always, were much more critical of themselves; however, there was consensus that the content presented at Boot Camps should be kept as simple as possible and as interactive as possible. This bootcamp also marked the first time for a female condom demonstration thanks to Emma Collingbourne. Very informational and interesting, indeed. Special thanks to everyone on the team who worked hard (and spent their Sunday) to make this Boot Camp a success: Nityanand, Emeline, Dan, Ninad, Emma, Shirish, Ashwin, Anshuman, Abbas, Michelle, Kathleen and all those who helped at Deep Griha Society. 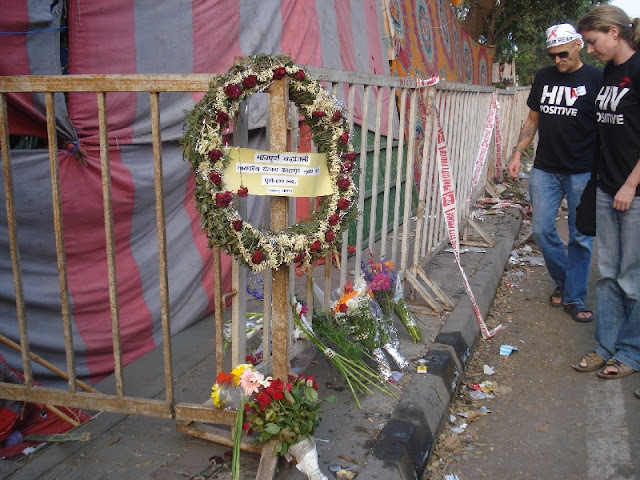 After the Boot Camp, many of us went to the German Bakery and placed 4 bouquets of flowers in front of what remains of one of our favorite meeting spots in memory of those who lost their lives and were injured in the 13th Feb 2010 bomb blast.